While it could hardly be classed as a forgotten programme, Steptoe and Son's fiftieth anniversary passed by last year with scarcely any notice. 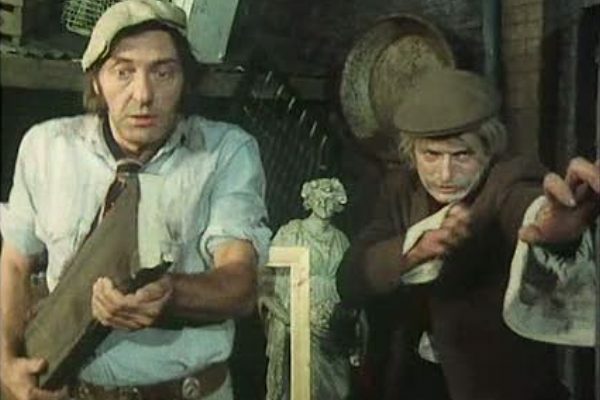 A sitcom about two rag and bone men that featured serious actors and dark characterisation, the programme was a seminal work and once highly regarded. 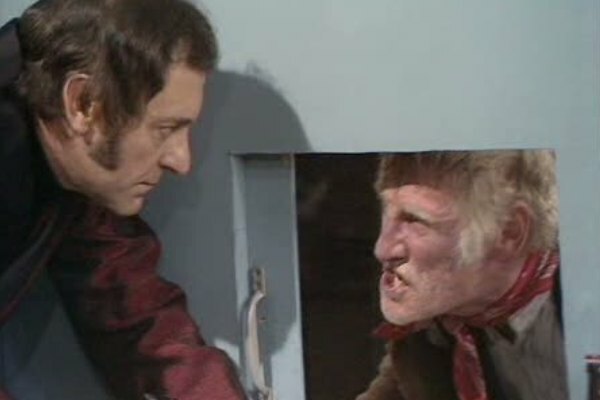 A final full series of Steptoe and Son, and, perhaps, a series too far. The ideas seem tired and weak, Corbett's performance is now so completely over the top that he even breaks the fourth wall, and many of the dialogue sequences stray into repetition. While one valid criticism of the programme is that it can be, by its very nature, variations on a theme, it's notable that the penultimate episode is a straight retread of ideas explored in 1962. The worst episode is the ludicrous kung fu cartoon nonsense of The Seven Steptoerai, an instalment completely at odds with the majority of the series, and a startling step away from its origins. With his sideburns now almost deserving of top billing, Harry H Corbett looks too old at nearly 50 to be bringing the antics of the increasingly childish Harold Steptoe to life. Once the character was a man with aspirations and pretentions... in the 70s he was repeatedly accepting of his fate in life, and existed in the series as a curious man-child, shorn of any genuine edge he once possessed. However, worth a look is the closing credits of one of the better episodes, Upstairs, Downstairs, Upstairs, Downstairs: there's a moment where Brambell appears to break character for a second and smile at Corbett's infectious clowning, a nice counterpoint to the tabloid rumours that the two didn't get along in real life. The second Steptoe and Son film didn't do enough at the box office to warrant a third, but is by no means a weak link... its low placing here is more to do with the quality of what's above it, rather than the film itself. However, there is an uneasy balance between the filmic direction/bleaker moments and the film trying to pull itself back into a more overtly comedic, farcical format. It's a film that, on one hand, has macabre elements around Albert's death, and contains the stark revelation that Harold has hit him in the past. On the other hand, it introduces Frankie Barrow, a misjudged cartoon villain, and has such badly-written female characters that there's an end credit for "Dolly Bird". While episodic and variable in tone, the film stock and scaled back performances (for the period) do make this one worth a look. The first series to still exist in full colour, series seven is consequently the most-repeated, and, to the majority of the general public, their perception of the programme overall. 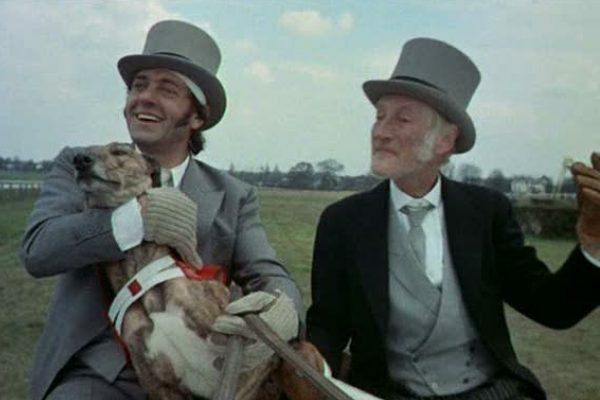 It's a shame, because, while often superficially amusing, it's the series where Steptoe and Son changes from a dark character comedy intent on socio-political commentary and into a standard sitcom format. The "two men alone" concept appears just once here, as a variety of guest characters interact with the Steptoes, and such crowd-pleasing fare as elderly ladies showing their knickers clash with scantily clad women and the two leads dressing up in drag. The elements of racial mockery come from Harold almost as much as his father here, the attempts at satire now long shed in favour of pleasing the lowest common denominator. With a revised jaunty, upbeat theme tune and a studio audience so amped up you can actually hear them speaking during at least one episode, this is broad, coarse stuff, a sitcom like any other. As plots, most of them still hold up fairly well, but you can't help but feel it's the final two series of the programme that prevent it from being so widely acclaimed today. 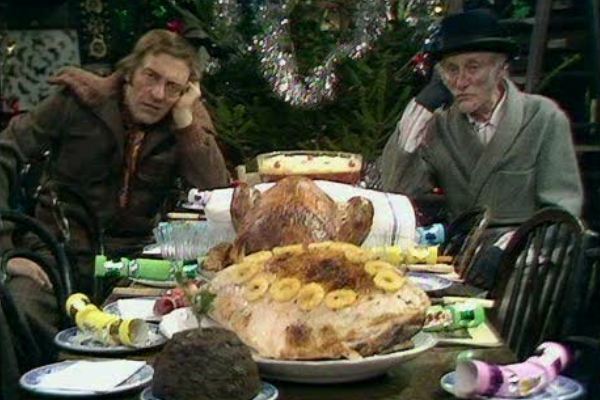 Steptoe and Son managed to break several unwritten rules of UK sitcoms, particularly of the period: not only was it able to have film spin-offs that weren't completely unwatchable, it was able to do the same for Christmas specials, too. This isn't the finest hour of the programme, but it's well above standard, with pointed political references to Enoch Powell that still hold up today. Things do start to fall apart a little towards the end, where the world's fastest-spreading chickenpox outbreak and a "face in trifle" comic payoff can't help but bring later episodes of Rentaghost to mind... and I say that as a Rentaghost fan. 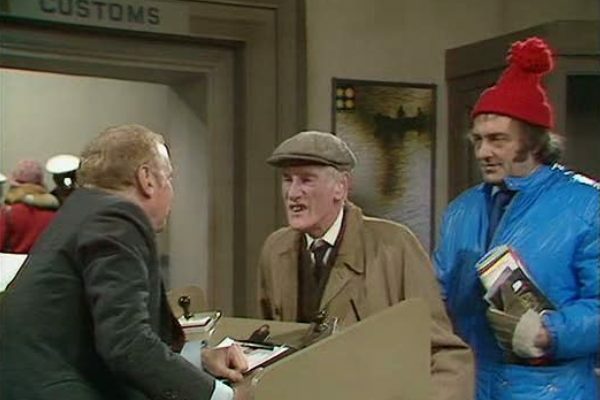 Other than commercials and stage plays, this was the last time we'd see Corbett and Brambell as Steptoe and Son. While this special does often feel like the same script as the previous year's festive edition, just with odd lines of dialogue rewritten, it's notable on several fronts. The main one is, of course, that it's the one time that Harold wins, a rare note of positivity in the basic situation. And look out for Corbett running down stars who appear in Christmas specials, but film them during October... a rare post-modern gag from the show, given that it was being recorded on 26th October. We also have extended dialogue sequences where he reflects on the resentment of his upbringing, and we learn that Albert never knew his own father. 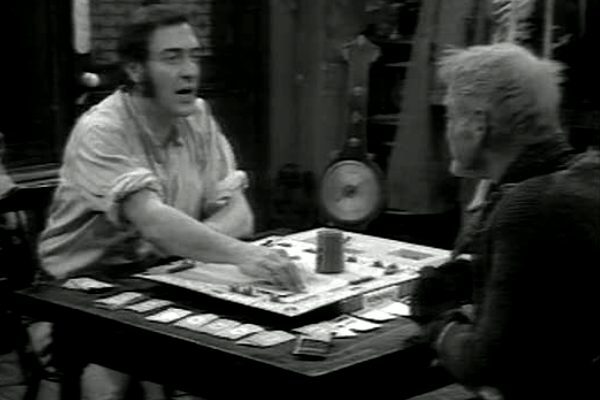 Steptoe and Son was never a programme that relied heavily on continuity, and as the series ends for good, we find that – his revised birthdate notwithstanding – Albert has aged eight years over the course of the series, while his son has managed just three. This is even more confusing when you consider that the first feature film took place over a time period of around four years. It seems that life for Harold Albert Kitchener Steptoe really was one of arrested development. series five marked the start of not only the colour era and the return of the programme, but also a greater production rate: series six arrived just seven months later, and two more series plus a couple of Christmas specials and two feature films were all made in a period of less than five years. Add to this that they were also adapting over 50 episodes for radio from the mid 60s to mid 70s, and it was an extraordinary rate of production. Sadly, this first colour series (now existing only in black and white, often in poor quality, due to the BBC junking archive material) sees Harry H Corbett emerge from the four year TV hiatus with far less restraint than before. 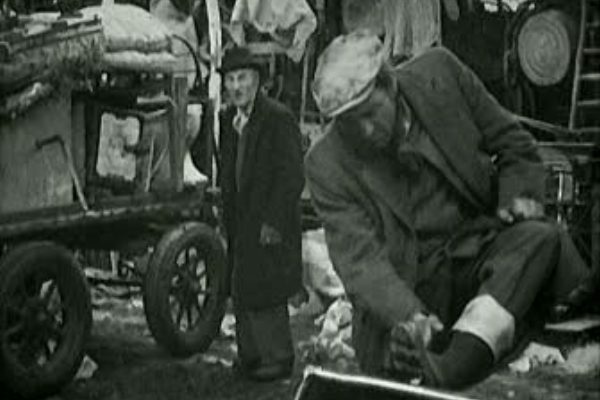 When Steptoe and Son began the two leads were actors in comedy roles. By this stage they're so familiar to audiences and so successful that the difference between playing it for real or giving a performance that every child in the playground can imitate begins here. But while we get odd occurrences such as a silent, waterless shower, or Harold in a dream sequence, Corbett is still more than capable of reminding viewers just how good he can be in the fifth series' finest episode. Lastly, while it's not the intention to regularly revise old articles, it must be noted that the "waterless shower" episode was remade for a BBC season of recreated sitcom episodes in 2016, with Jeff Rawle and Ed Coleman playing the parts. On even happier news, October 2018 saw some original Steptoe and Son episodes discovered in better quality. Sadly, the same month brought sadder news... writer Ray Galton died, following on from his writing partner Alan Simpson's death in February 2017. Best Episode: Steptoe and Son — and Son!